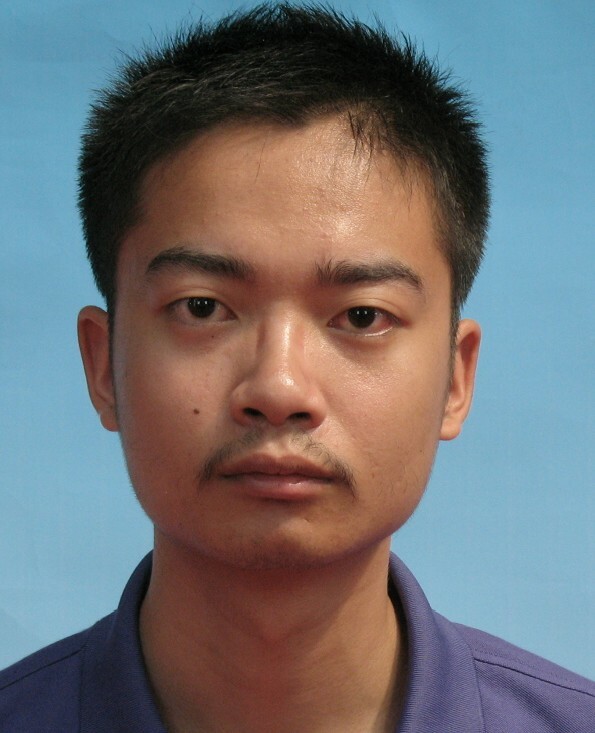 I am currently a fifth year Ph.D. student in computer science department in University of Southern California under the guidence of Prof. Jernej Barbič. My research interest is computer graphics. Before coming to USC, I was an undergraduate in the Department of Computer Science and Technology in Tsinghua University, Beijing, China. IEEE Transactions on Haptics 2018, 11(3), 2018. Simulating frictional contact between objects with complex geometry is important for 6-DoF haptic rendering applications. For example, friction determines whether components can be navigated past narrow clearances in virtual assembly. 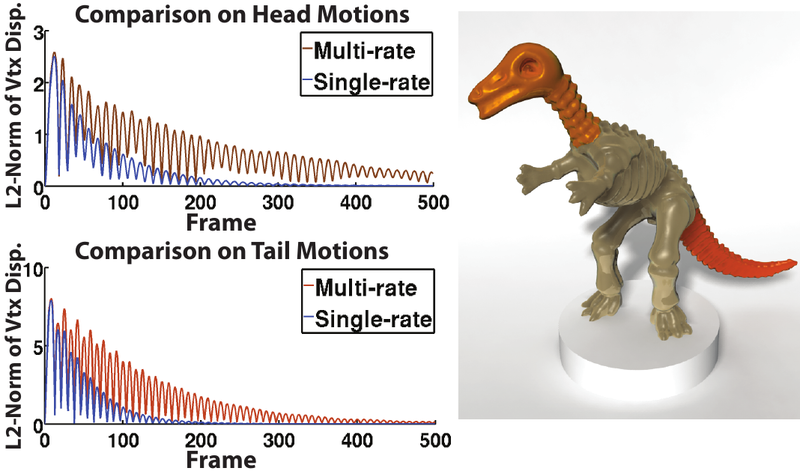 State-of-the-art haptic rendering of frictional contact either augments penalty contact with frictional penalty springs, which do not prevent sliding and cannot render correct static friction, or uses constraint-based methods that have difficulties in meeting the stringent haptic loop computation time requirements for complex geometry. We give a 6-DoF Coulomb friction haptic rendering algorithm for distributed contact between rigid objects with complex geometry. Our algorithm is compatible with the fast point vs implicit function penalty-based contact method such as the Voxmap-PointShell method. Our algorithm incorporates the maximal dissipation principle and produces correct static friction, all the while inheriting the speed of penalty-based methods. 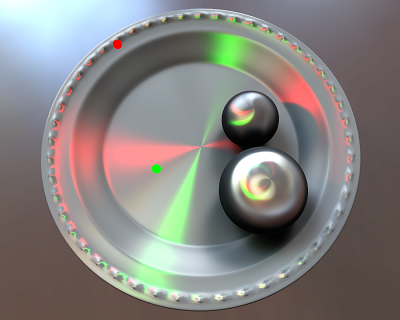 We demonstrate our algorithm on several challenging 6-DoF haptic rendering examples. Symposium on Computer Animation (SCA) 2016, Zurich, Switzerland. In standard deformable object simulation in computer animation, all the mesh elements or vertices are timestepped synchronously, i.e., under the same timestep. Previous asynchronous methods have been largely limited to explicit integration. We demonstrate how to perform spatially-varying timesteps for the widely popular implicit backward Euler integrator. Spatially-varying timesteps are useful when the object exhibits spatially-varying material properties such as Young's modulus or mass density. In synchronous simulation, a region with a high stiffness (or low mass density) will force a small timestep for the entire mesh, at a great computational cost, or else, the motion in the stiff (or low mass density) region will be artificially damped and inaccurate. Our method can assign smaller timesteps to stiffer (or lighter) regions, which makes it possible to properly resolve (sample) the high-frequency deformable dynamics arising from the stiff (or light) materials, resulting in greater accuracy and less artificial damping. Because soft (or heavy) regions can continue using a large timestep, our method provides a significantly higher accuracy under a fixed computational budget. ACM Transactions on Graphics 32(6), 209:1 - 209:11, 2013. (Proceedings of SIGGRAPH Asia 2013). We present a novel Anisotropic Spherical Gaussian (ASG) function, built upon the Bingham distribution [Bingham 1974], which is much more effective and efficient in representing anisotropic spherical functions than Spherical Gaussians (SGs). In addition to retaining many desired properties of SGs, ASGs are also rotationally invariant and capable of representing all-frequency signals. To further strengthen the properties of ASGs, we have derived approximate closed-form solutions for their integral, product and convolution operators, whose errors are nearly negligible, as validated by quantitative analysis. Supported by all these operators, ASGs can be adapted in existing SG-based applications to enhance their scalability in handling anisotropic effects. To demonstrate the accuracy and efficiency of ASGs in practice, we have applied ASGs in two important SG-based rendering applications and the experimental results clearly reveal the merits of ASGs.